In males in the UK, breast cancer is not among the 20 most common causes of cancer death (less than 1% of all male cancer deaths). In females in the UK it is the 2nd most common cause of cancer death (15% of all female cancer deaths). 1% of breast cancer deaths in the UK are in males, and 99% are in females. Breast cancer mortality rates (European age-standardised (AS) rates ) are similar to the UK average in all the UK constituent countries. Data is for UK, 2016, ICD-10 C50. 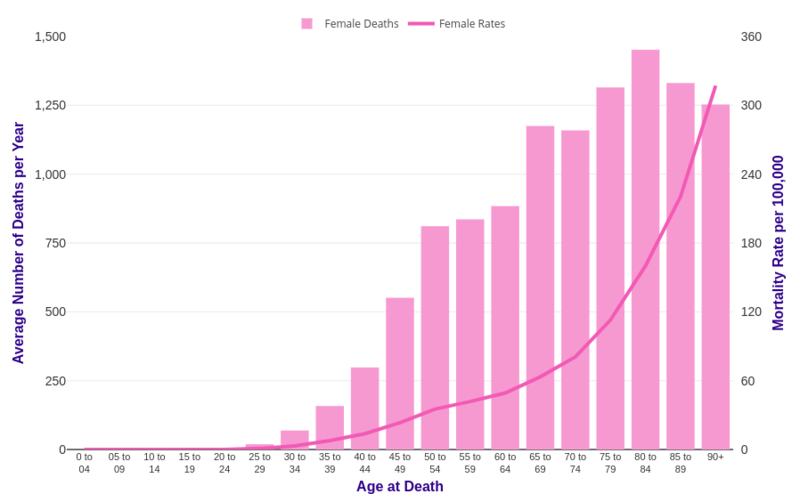 Breast cancer mortality is strongly related to age, with the highest mortality rates being in older people. 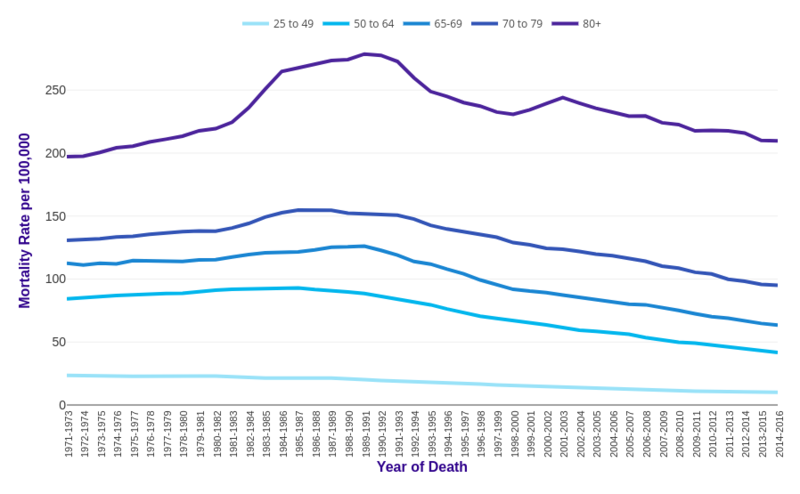 In the UK in 2014-2016, on average each year almost half (47%) of deaths were in people aged 75 and over. [1-3] This largely reflects higher incidence and lower survival for breast cancer in older people. 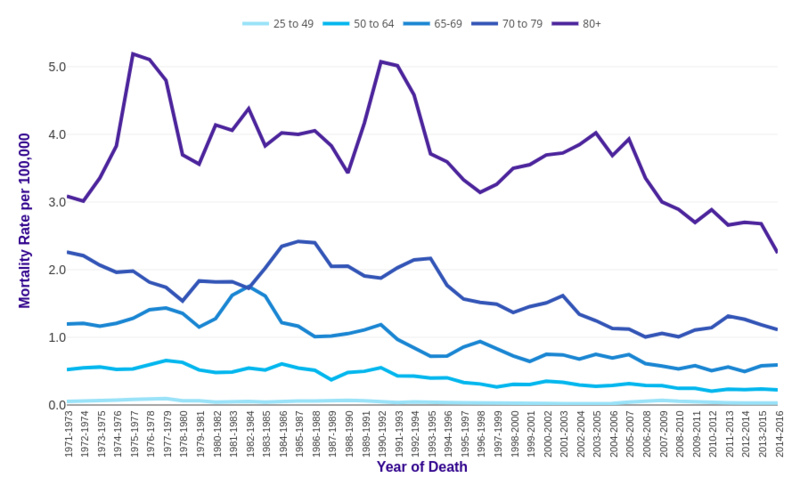 Age-specific mortality rates rise steadily from around age 30-34 and more steeply from around age 70-74. The highest rates are in the 90+ age group for males and females. 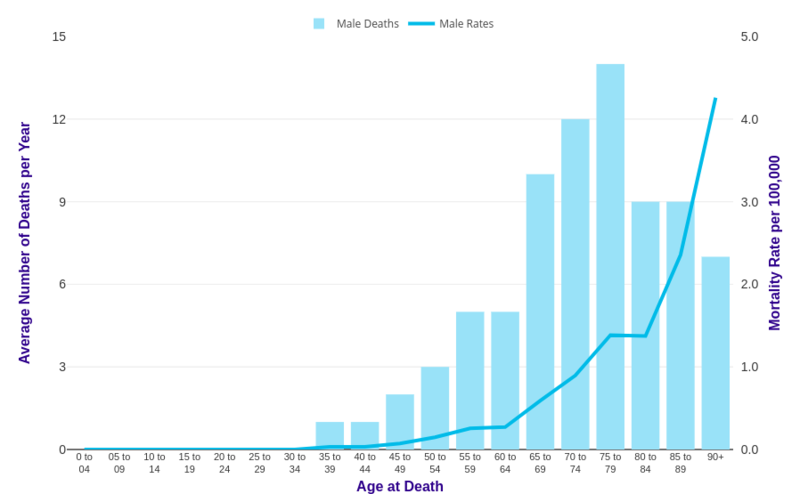 Mortality rates are significantly lower in males than females in a number of (mainly older) age groups. The gap is widest at age 40 to 44, when the age-specific mortality rate is 438 times lower in males than females. Data is for UK, 2014-2016, ICD-10 C50. 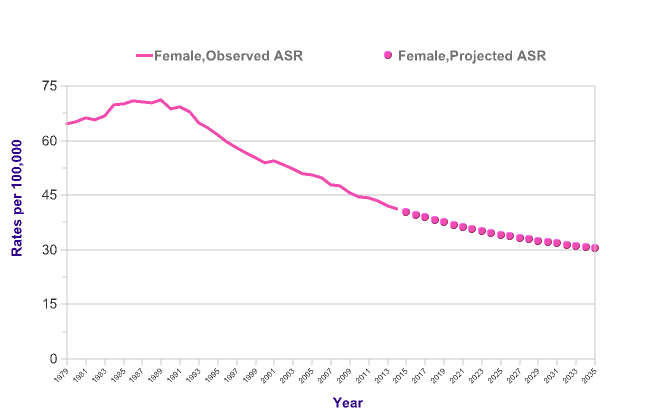 Breast cancer European age-standardised (AS) mortality rates for males and females combined decreased by 38% in the UK between 1971-1973 and 2014-2016. [1-3] The decrease was larger in males than in females. For males, breast cancer AS mortality rates in the UK decreased by 45% between 1971-1973 and 2014-2016. For females, breast cancer AS mortality rates in the UK decreased by 35% between 1971-1973 and 2014-2016. Over the last decade in the UK (between 2004-2006 and 2014-2016), breast cancer AS mortality rates for males and females combined decreased by 22%. [1-3] In males AS mortality rates decreased by 23%, and in females rates decreased by 19%. 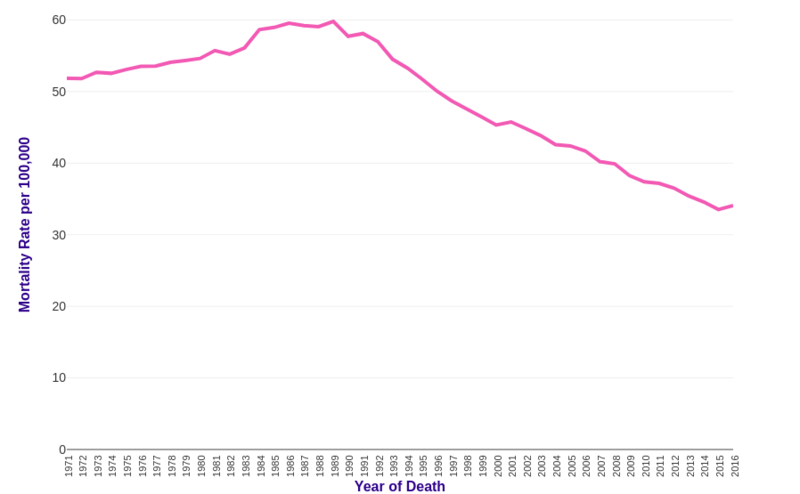 Breast cancer mortality rates have decreased overall in most broad adult age groups in females in the UK since the early 1970s, but have increased in some. [1-3] Rates in 25-49s have decreased by 57%, in 50-64s have decreased by 50%, in 65-69s have decreased by 44%, in 70-79s have decreased by 27% and in 80+s have increased by 6%. 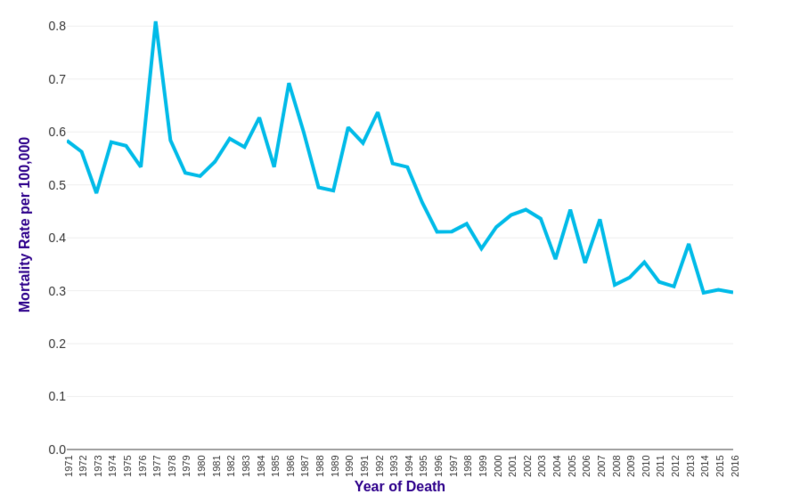 Breast cancer mortality rates have decreased overall in some broad adult age groups in males in the UK since the early 1970s, but have remained stable in others. [1-3] Rates in 25-49s have remained stable, in 50-64s have decreased by 58%, in 65-69s have decreased by 51%, in 70-79s have decreased by 51% and in 80+s have remained stable. Data is for UK, 1971-2016, ICD-10 C50. Breast cancer mortality rates are projected to fall by 26% in the UK between 2014 and 2035, to 31 deaths per 100,000 females by 2035. It is projected that 11,876 deaths from breast cancer will occur in the UK in 2035. Projections are based on observed incidence and mortality rates and therefore implicitly include changes in cancer risk factors, diagnosis and treatment. It is not possible to assess the statistical significance of changes between 2014 (observed) and 2035 (projected) figures. Confidence intervals are not calculated for the projected figures. Projections are by their nature uncertain because unexpected events in future could change the trend. It is not sensible to calculate a boundary of uncertainty around these already uncertain point estimates. Changes are described as "increase" or "decrease" if there is any difference between the point estimates. There is evidence for a small association between female breast cancer mortality and deprivation in England. England-wide data for 2007-2011 show European age-standardised mortality rates are 6% higher for females living in the most deprived areas compared with the least deprived. 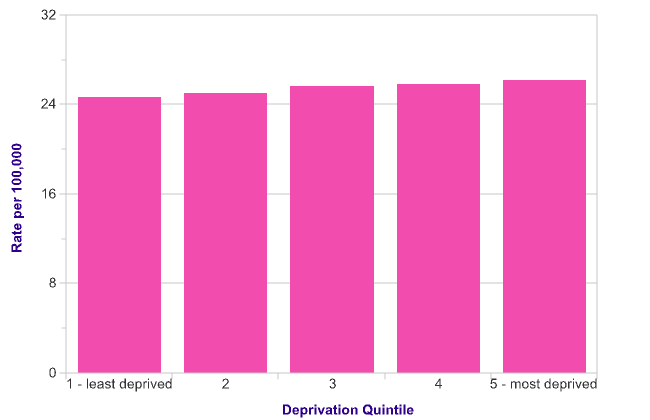 The estimated deprivation gradient in breast cancer mortality between females living in the most and least deprived areas in England has not changed in the period 2002-2011. It has been estimated that there would have been around 350 fewer female breast cancer deaths each year in England during 2007-2011 if all females experienced the same mortality rates as the least deprived. There is no evidence for an association between breast cancer mortality and deprivation in males in England. England-wide data for 2007-2011 show European age-standardised mortality rates are similar for males living in the most deprived areas compared with the least deprived. 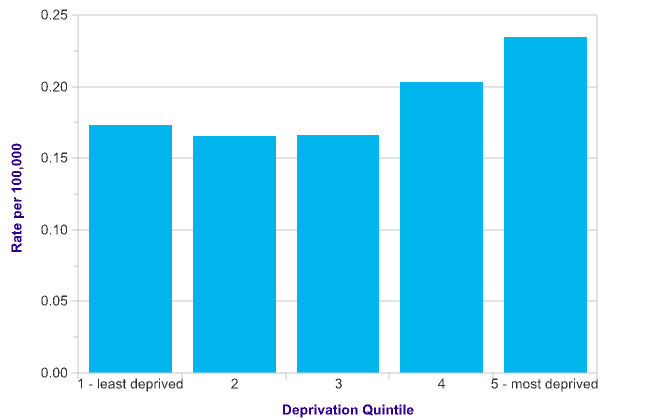 The estimated deprivation gradient in breast cancer mortality between males living in the most and least deprived areas in England has not changed in the period 2002-2011.